As s a wealth creation tool, property has always fascinated Andrew Higgs. “I remember visiting my aunty as a kid in the 1980s,” he says. “[She] had moved out from my grandparent’s Glen Waverley home, to Melbourne’s then fringe suburb of Dandenong to get into the market in her 20s. Andrew explains how easy she made property investment look, however notes she was the first person to approach him in his 20s to warn him of the pitfalls. Hindsight is always a great thing, but doing something is actually more important. Sometimes we can over-analyse the market and sit on the sidelines for too long. For Andrew, the best investment he ever made was in his property education. “With the help of my mortgage broker, I enrolled in a weekend course with speaker Peter ‘the Property Professor’ Koulizos and have never looked at a brand new mega-complex again,” he says. That advice led Andrew on a hunt for older boutique unit complexes within inner Sydney that enjoyed high land to value ratios with a capacity to add value. Andrew explains that, for him, Kirribilli has been an investor’s dream – delivering the rare hybrid of capital growth and a growing yield across a five-year period. Reflecting on his journey, Andrew admits that he believes people get so eager to make a move that they buy the first thing that looks like a good deal. “I’ve learnt that investing in yourself first, through education and committing to seeing 100 properties before you buy, is the road to investment success,” he says. 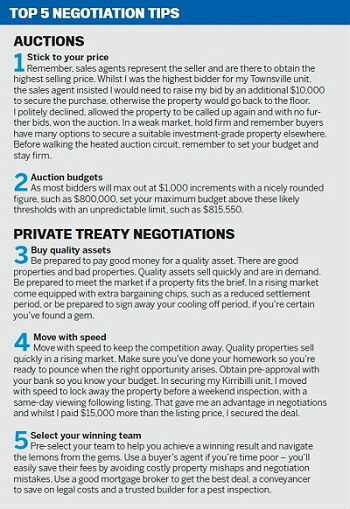 When Andrew first decided property investment was for him, he attended a number of seminars and road shows, including one in 2008 across Cairns. “One development on the trip was the conversion of the Woree drivein cinema site slated for a 520-unit residential development,” he explains. “After putting down a deposit for a unit I got cold feet following some strong advice from friends and I pulled out of the deal. Andrew explains that settling on his first property was a roller coaster ride of emotions. Armed with a St George mortgage pre-approval and his mortgage broker’s reassurance to start bidding, he lodged his first holding deposit on a property only to be told the St George Bank wasn’t prepared to lend against a ‘tenants in common’ property under 50sqm. “At the eleventh hour I secured a last-minute mortgage with Westpac, to save both my deposit and settle the purchase of the Kirribilli unit,” he says. For Andrew, setting rental rates has been an interesting business. “Over the past five years, I’ve been successful in raising the rents across each of my properties, however, over the past two years they have each fallen back with rising vacancy rates and changing market conditions,” he says. He explains that at times of diminishing cash flow and extended vacancies he has learnt to drop rates to meet the market and to park feelings of greed. With pressure on the banks to grow margins, it is Andrew’s experience they are as keen as ever to win over more lucrative home lending business and your loan book. “With cash incentives to switch and banks increasing investor rates, there is value in revisiting your home loan rates with your bank manager,” he says. During his seven years of investing, Andrew has been fortunate in having only a few tenant issues. “After settling on my Townsville unit, I was probably a little too keen to get it tenanted and leased it to a group of university guys,” he says. “Before long I was receiving complaints from onsite management about late-night drinking sessions, a pool expose and rowdy house parties. I sell coffee for a living as a national business manager for international Dutch firm JDE. It’s such a privilege to represent brands such as Moccona and Piazza D’Oro, and be part of somebody’s daily ritual. It’s amazing how coffee and property are so deeply connected. You watch how new cafés move into an area like a valuation barometer, and as they become more trendy, you know the demographic is shifting and so are valuations. So my advice to Australia is: wake up and smell the coffee – your local café is giving you more than just a caffeine hit.